We took the chance to make some changes to X3: Terran Conflict and X3: Albion Prelude again. This time we added a borderless window mode, which allows you to play the game in window mode but without having to deal with an overlapping taskbar. This also fixes some menu display issues (truncated text lines in menus), which previously could appear when using normal windows mode under Microsoft Windows. Furthermore we improved the performance in busy sectors, which will especially be noticeable in larger battles. Always good to see these games still getting some love One question, are these updates likely to cause any issues with older mods? Only it seems to me that most of the popular mods for TC and AP aren't likely to be getting compatibility updates these days because their authors have moved onto other things. Any chance we could get a list of the files changed, e.g. if only the executable and a handful of scripts have changed since the last version of X3TC/X3AP? Copying that forward would be a lot easier than having to rebuild my entire modded directory off the latest Steam files in their entirety. Last edited by Raider480 on Thu, 7. Dec 17, 19:39, edited 1 time in total. I'm so happy right now. This missing feature bugged me for years. I'll take that as a good omen for X4. Raider480 wrote: Any chance we could get a list of the files changed, e.g. if only the executable and a handful of scripts have changed since the last version of X3TC/X3AP? Copying that forward would be a lot easier than having to rebuild my entire modded directory off the latest Steam files in their entirety. X3TC.exe - though you'll want the nosteam version of these anyway. and a heap of changelog and pck files. I am speechless that TC is still getting updated. X3:TC Heavy M6 guide : : : Let's pretend you are an addict, lets pretend that you are a X-games player... but i am repeating myself here. imperium3 wrote: One question, are these updates likely to cause any issues with older mods? Only it seems to me that most of the popular mods for TC and AP aren't likely to be getting compatibility updates these days because their authors have moved onto other things. It's rather unlikely that any of the changes in these updates causes conflicts with any script or mod for X3TC or X3AP. Litcube's Universe is the only currently still developed mod that changes the .obj files, so I would be careful with that. Apart from that, if you're using the NoSteam.exe for X3AP, make sure to download the updated version from here. Rode my bicycle across the USA in 2014. Here's the travel blog with lots of words & pictures. The performance improvements will depend on the situation. They are not huge, but they should be at their most noticeable in situations where the are a lot of bullets flying around. If your game was previously limited by GPU constraints rather than CPU then you probably won't see any difference at all. XanII wrote: I am speechless that TC is still getting updated. LOVE the updates for TC and Albion!! Yea!! Performance improvements are always welcome, especially if it helps with large battles. Thanks. Did GOG game files get an update to the X3 Terran War Pack which includes both X3TC and X3AP ? 2. Confusing - See the patch versions in the following screenshot ..
3. And usually I get an update notification on GOG, there was no prompt to tell me this has been updated at all. They have received the update, but they may not yet have made it available. Thanks CBJ, it may well be the update already (GOG have weird ideas about versioning sometimes), the last files I downloaded from them were version 2.3.0.6 which I believe equated to X3AP version 3.2 ..
.. 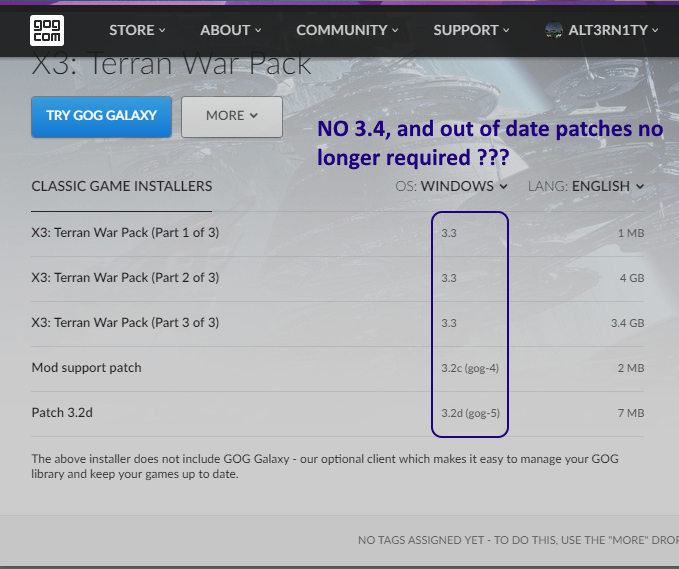 So to get to 3.3 they have obviously updated since, but it may have been an update I missed which did not prompt me. Anyway, going to install these newer GOG files to what I had previously, and see what I can found out about it.